Louisville, CO began as a coal mining town in 1877 in Boulder County and was later incorporated in 1882. Louisville is 10 miles southeast of Boulder and 23 miles northwest of Denver. From the late 19th century into the 20th century, coal mining was the dominant industry in Louisville, where dozens of mining companies operated within the city limits. Today, Louisville is known for being a high-tech hub for the aerospace industry. The population of Louisville is around 20,000. Boulder County has a population of over 313,000, and the Denver metro area has a population of 5.5 million people. Louisville’s population growth rate through 2020 is expected to be just under 2%. Louisville has over two dozen parks, and many of these parks have biking/hiking paths, playgrounds, multi-purpose field, basketball courts, tennis courts, and nature areas. Just a few minutes away is Boulder, a college town with plenty of trendy restaurants, businesses, galleries, and entertainment venues. 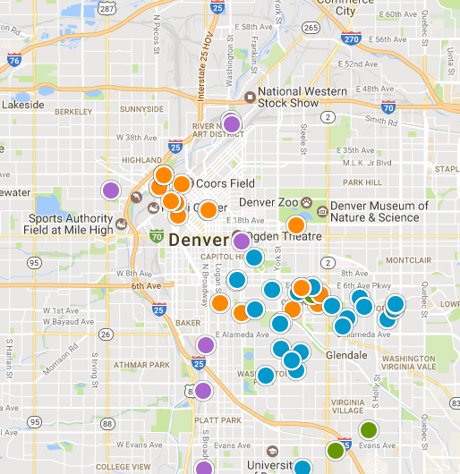 Denver is also nearby, and it offers a variety of attractions one would find in a large city. For those who are looking for outdoor activities, they can take a day trip to the Rocky Mountains to enjoy skiing, hiking, rafting, fishing, and other activities. Boulder Valley School District No. Re2 serves PreK-12 students in Louisville. Boulder Valley has over 60 schools, and five elementary schools, two middle schools, and one high school are located in Louisville. Great Schools has ranked all of Louisville’s schools as above average with scores of either 8, 9, or 10 based on standardized test results compared to other schools in the state. The current median sales price of a single-family home in Louisville is $521,000, which is one of the highest in Colorado. This is only a 1% increase from a year ago. The cost of living in is high for many people, but Louisville consistently ranks as one of the best cities in the country for families because of its low crime rate, family-friendly community, and top-quality public schools. Want to see the latest Louisville housing market activity? Create a free custom market report for YOUR neighborhood or area!